Enjoy your stay at Destiny Motel - deluxe accommodation in Palmerston's City Center. Welcome to Destiny Motel. Enjoy your stay in Palmerston North. Our quality accommodation is located in central Palmerston North. We take care of the finest attention to detail at Destiny Motel, and look forward to making your stay in Palmerston one to remember. 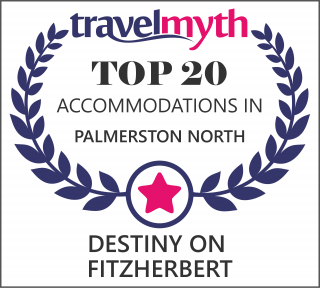 Destiny on Fitzherbert offer luxury Palmerston North accommodation in the heart of the Central City.